When a WordPress user requests a non-existing page on your WordPress website an HTTP 404 error is generated. The WP Security Audit Log plugin keeps a record of such request in the WordPress activity log. As shown in the screenshot below, the Event ID for users requesting non-existing URLs is 6007. Note: Such requests are called 404 requests because the web server returns a HTTP 404 error when a non-existing page is requested. Refer to the list of HTTP Status codes on Wikipedia for more information. By default only the logging of 404 requests generated by WordPress users are logged. This document explains how to change the logging options. Note that all of the below logging options are available for the individual events 6007 and 6023. Enable the option Capture 404 requests to file as seen in the screenshot below. To automatically purge log files which are older than one month enable the option Purge log files older than one month which is marked with number 5 in the above screenshot. By default the plugin will keep keep a log of 99 requests in the log file. Therefore if a logged in user from a specific IP address requests 100 non-existing pages the plugin will keep a log of the first 99 requests. Once 24 hours pass it will reset the count and starts counting again. To increase or decrease the number of logged non-existing pages requests (404 requests) specify the number of requests you’d like to keep a log of in the option Number of 404 Requests to Log, which is highlighted with the number 6 in the above screenshot. You can also configure the plugin to capture the referrer which has generated the 404 error. So if you have a broken link and your website visitors click on it, you know where the broken link is. To enable the logging of the referrer in the log file enable the option Record the referrer that generated the 404 error which is marked with number 7 in the screenshot above. You can also exclude the logging of specific non-existing URLs on your website. To do so refer to how to exclude the logging of specific HTTP 404 errors. The naming format of the log files is [Event_id]_[yyyymmdd].log. 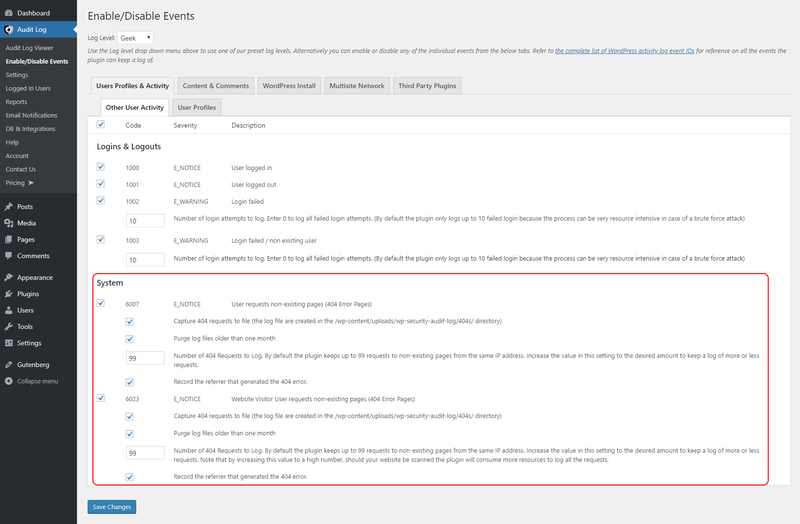 The Event_id can be either 6007 in case of the log file for WordPress users or 6023 in case of website visitors.